So, what does it take to be a successful salesperson? Some experts believe that a person’s attitudes, personality, and work methods together classified as their “approach to work” are virtually the entire basis for professional success. Common sense dictates that a person’s approach to work plays an important role in their performance on the job. By the very nature of the work itself, successful salespeople possess a unique set of personality attributes that enable them to succeed. Mediocre sales performance cannot be disguised as a salesperson’s success or failure is revealed immediately by the bottom line results. It takes a special kind of individual to succeed in sales. When you listen to your clients/customers, you find out what they want and need, and how to make that happen. If you don’t know exactly how to make happen what your client has asked for, be absolutely sure that there is a way. You just haven’t found it, yet. The best sales people ask their clients and prospects plenty of quality questions to fully determine their situation and buying needs. They know that the most effective way to present their product or service is to uncover their customer’s goals, objectives, concerns and hesitations. This allows them to effectively discuss the features and benefits of their product and service that most relate to each customer. A person with focus is internally driven to accomplish goals and can stay attentive to one topic. Focused individuals are more demanding of themselves than other people and they are self-motivated. They are able to organize themselves and recognize what needs to be done in order to achieve their goals. 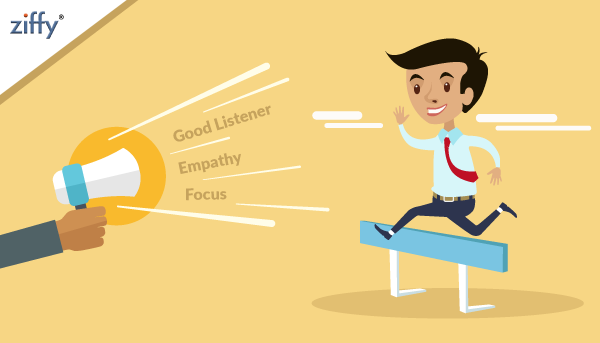 In a salesperson, focus produces best results when it is balanced with empathy. You then see a person who listens and identifies with the customer while keeping focused on set goals, and who is able to translate these goals into solutions for the customer.